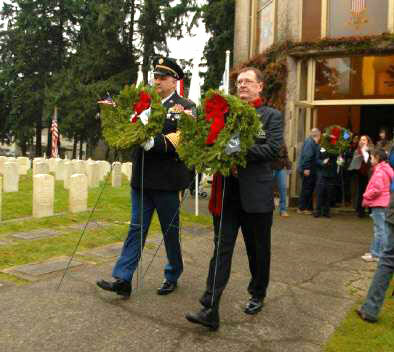 On December 15, the annual Wreaths Across America event was held at the Veterans Cemetery at Evergreen Washelli in north Seattle. Several VFW Post 8870 members participated, including those members who who are part of the combined honor guard of our South Snohomish County VFW posts. Each December on National Wreaths Across America Day, supporters gather to “Remember, Honor and Teach” by coordinating wreath-laying ceremonies at Arlington National Cemetery, as well as over 1,400 additional locations, at sea, and abroad. Post 8870 donates funds to purchase wreaths annually to support this mission.